The crotch area of a pair of trousers is a high-stress area on the garment. The seams are constantly being tugged in opposite directions as you walk and run, and the fabric endures constant friction against itself, your undergarments and the surfaces you sit on. If you have a pair of trousers that are well made and that you wear often, the crotch seam will likely need repairing at least once in the life of the garment. Repairing seams will help you hang on to your favorite trousers longer. Turn the trousers inside out. Locate the ripped crotch seam. Remove all broken threads from the ripped seam. Remove any stitches from the seam that are stretched or nearly broken, using the seam ripper to break the stitches. 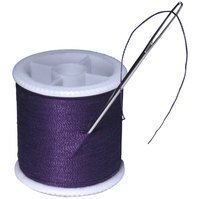 Thread your needle with a double thickness of thread in a color that matches your trousers. Knot the end of the thread. Hold the sides of the seam together, wrong sides facing out. Insert your needle 1/2 inch to the left of where the crotch seam rip begins, right next to the seam line. Pierce both layers of fabric. Insert your needle from the back of the work 1/4 inch to the right. Insert your needle into the front of the work 1/8 inch to the left. Continue stitching 1/4 inch to the right, then 1/8 inch back, until you have stitched to 1/2 inch to the right of where the rip ends. Cut the needle from the remaining thread and tie a knot close to the seam. Trim the loose thread. Jeans may require a thicker needle than thinner fabrics. Ask at a craft or fabric store for needles suitable for repairing jeans by hand.